Being a Girl in Cumbana | Wait... What? Sometimes being a girl is no piece of cake. For the Youth Empowerment through Arts and Media (YETAM) workshop we hoped to have 50% girls participating, and we ended up with about 15 girls and 40 boys. The boys raised this on the 3rd day of the workshop (through no prompting by the facilitators). “Why aren’t there more girls here? And the girls who are here, they never talk, they just sit there.” “They don’t have the ambition or the drive to improve themselves so they don’t even come to workshops like this when they have the opportunity”. Photo: Painting the mural. Being a girl isn’t only an obstacle to participating in workshops. In the community over the past 3 weeks, I saw and heard about the challenges girls face to achieve an education, avoid unwanted advances, including from teachers, and avoid early pregnancies. Most of the time there is no space for these issues to be discussed openly among both boys and girls, and with adults. 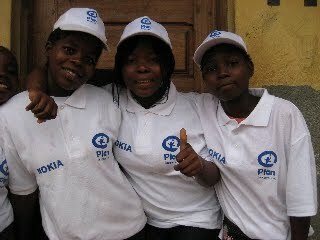 Plan’s two campaigns, Learn without Fear and Because I am a Girl, seem extremely relevant to the context. So I was really happy that the theater group decided to do their play about the things that girls face, even more so because there were only about 4 girls in the theater group, and the 3 facilitators were male. (There are not many female teachers and facilitators to work with). Now that we had divided into small group and we’d been working together for several days, the girls’ voices were much louder. 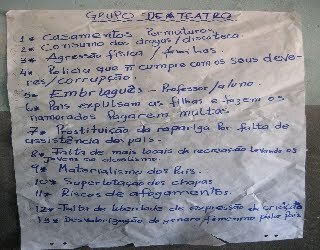 Photo: the issues chosen by the theater group included early marriage, drug abuse, physical aggression in families, corrupt police, professors/student fights, lack of value placed on girls within families. The groups had their showcase on Nov. 20, coinciding with the celebration of the 20th Anniversary of the Convention on the Rights of the Child (CRC). Some 300 people from nearby primary schools and communities attended the event.The painting group’s mural greeted people as they came into the school grounds. Under giant orange tarp (which pretty much ruined any chance of getting good photos/videos since everything had a very strange light) the music group sang 2 songs about education and HIV prevention and performed a traditional dance. The media group showed 6 of their videos, on life in the community, the importance of the river, trash in the market, the discotheque, and the local cinemas. The journalism group shared their community newspaper, and the theater group performed their play. The storyline in the play is of a girl whose father marries her off for money; she is taken off to her new husband’s place and becomes pregnant. Her husband is abusive, alcoholic and brings other women home. He beats her, but her mother finds out and they report it to the police. The police come to take a report, admonishing the husband and telling him that he is going to jail. No matter, nothing a little private conversation and bribe won’t solve. So the tables turn with the policeman admonishing the girl that she should not treat her husband badly and she deserves what she got. As soon as the police leave, he beats the girl again, shouting as her father had shouted at her mother “In this house it’s the man who’s in charge!” He throws her out on the street. A friend tries to convince her to prostitute herself and make good money and she refuses. The play ends as she looks at the audience, carrying the small bundle of her child, and asks “Why will people say this is my fault?” The other actors come out one by one, calling on governments, parents, friends, school, teachers to see the situation clearly and to take on their responsibilities to change this scenario. I have to say it was one of the best theater pieces I’ve ever seen, and it was written entirely by this group of 9th and 10th graders. Photo: Theater group closing out after a day of rehearsing. 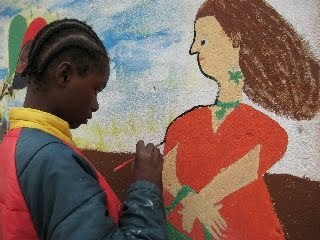 Each different art or media form carried the messages on issues that the youth want to raise and change in their communities. Once more it was a reminder that it’s the communication objectives and impact on the audience that matter, and the choice of the tools should be secondary, based on the outcomes to achieve. We are not “doing media projects”, but helping kids to use different tools, including media, to dig into their realities and then use those tools as effective means of communication to make change in their communities. What may be a great topic for a video, may not work so well as theater, and vice versa. 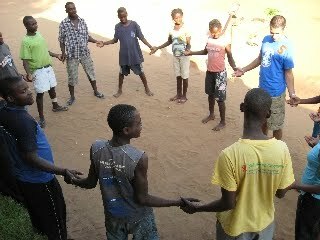 In the process of discussing the issues and the media forms that would be best to make change in the community, both boys and girls learn new personal skills and improve their self esteem as well as their own communication skills. They also have an opportunity to openly and deeply discuss issues among themselves and to understand each other better. The discussion around gender issues and how the same challenges may affect girls and boys differently is one of the most important that they can have. on June 2, 2010 at 3:46 pm | Reply Youth Empowerment through Tech, Arts, Media « Wait… What?